In American politics, deficits have suddenly become all the rage. Throughout the presidency of George W. Bush, the federal government hemorrhaged red ink, with no one paying much attention. Upon the election of Barack Obama, however, the rules abruptly changed. As if overnight, Republicans in Congress discovered that theirs is the party of fiscal conservatism. From out of nowhere came the Tea Party movement, providing at least a pretty good imitation of people who are “mad as hell” about a government unable to manage its own affairs and careening toward bankruptcy. Although the administration’s spending plans add more than a trillion dollars each year to the national debt, President Obama himself has allowed that this might not be such a good thing—for long. In Washington the sky grows dark with deficit hawks. But the deficits that plague the United States extend well beyond the realm of fiscal policy. At least as important is a deficit in self-awareness that makes it difficult for policymakers to learn from and avoid repeating past mistakes. Afghanistan offers a case in point. United States troops are currently engaged in an assault on a reputedly major Taliban stronghold at a place called Marja in southern Afghanistan’s Helmand Province. In the weeks leading up to the offensive, the Americans made no effort to disguise their intentions. “We intend to go in big, strong and fast,” promised the commander of the 2nd Marine Expeditionary Brigade, reflecting the best traditions of his service. Yet what promised to be a big fight has turned out to be more of a hard slog—with the real work still to come. 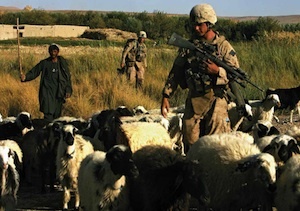 Once the Marines have defeated or dispersed the enemy, United States officials will dispatch a specially constituted civilian reconstruction team to Marja to rebuild a decrepit irrigation system and cajole Afghan farmers into growing something other than opium poppies, the sale of which sustains the anti-Western insurgency. “An unstated aim,” reports The Washington Post, “is to salvage a project the United States began more than 50 years ago.” Say what? It turns out that the Marines are not the first Americans to arrive in Marja intent on putting things right. When Dwight D. Eisenhower was president, the Agency for International Develop-ment embarked upon a massive agricultural re-form project there. The purpose of that project was to persuade nomadic Pashtuns to put down roots in Helmand. Domestication, it was thought, would put the kibosh on Pashtun agitation for an independent homeland, a prospect that the governments of Afghanistan and Pakistan both found deeply disconcerting. Unfortunately, this ambitious effort proved to be a complete bust. The Americans did not understand the local hydrology and did not understand the local populace. The Pashtuns clung stubbornly to their own ideas about agriculture and about life, neither of which conformed to U.S. ideas. “From the beginning,” wrote an A.I.D. analyst in 1973, “the project was plagued with basic cross-cultural misunderstandings and technical miscalculations.” Well before the Soviet invasion of Afghanistan in 1979, A.I.D. had conceded failure in Marja. So 50 years on, the United States will now try again, this time with good intentions—who can doubt that America means well?—backed by bayonets. The development specialists following in the wake of the Marines will no doubt arrive in Marja armed with various “lessons learned” drawn from the errors of their predecessors. Yet these will be lessons of a technical sort. The implicit assumptions informing version 1.0 of this undertaking survive to inform version 2.0—and there lies the problem. The central assumptions are these: a) that the Pashtun way of life is defective; b) that the Pashtuns know this and yearn for something better; c) that United States officials understand where the problems lie and by mobilizing American resources and skill can repair them; d) that in doing so, the United States will both improve the lives of ordinary people and enhance America’s standing in their eyes and in the eyes of many others. Little in the record of United States policy in Afghanistan (or elsewhere in the Greater Middle East for that matter) supports these assumptions. In fact, Pashtuns and other Muslims are as interested in preserving their way of life as in changing it—or, if entertaining change, they are insistent that it occur on their own terms. Reforms conjured up by the United States, informed by American perceptions of what is true, right and good, are frequently at odds with what devout Muslims consider to be true, right and good. The upshot is that American do-goodism succeeds neither in improving people’s lives nor in winning their hearts and minds. It serves only to encourage anti-Americanism. Policymakers in Washington seem unable to grasp this contradiction. Deeply, if unconsciously committed to the imperatives of secularized modernity, they cannot conceive of an alternative nor imagine that others might be inclined to do so. As they see it, the prerequisites of development (and therefore of a properly functioning society) are plain to see: a free-market economy, the rule of law, respect for individual rights, quality education and gender equality. And for good measure, let’s make birth control widely available to avoid an excessive birthrate. What fair-minded person could oppose any of these things, especially when advocated by individuals who endlessly and seemingly sincerely profess their high regard for Islam? What proponents of modernity cannot (or will not) see is that they are proposing to drive a wedge between religion and politics, consigning each to a separate sphere. Whether wittingly or not, they are thereby launching a direct attack on Islam itself, which insists that the two spheres must be one: Allah governs. One might speculate that the casual, allocate-the-Lord-an-hour-on-Sunday religiosity to which so many Americans subscribe makes it difficult for us to understand any connection between religion and getting on with the job at hand. We ourselves have consigned God to his rightful place and insist that he stay put. Seeing themselves as good Christians, or at least as respectful of believers, United States commanders, diplomats and aid workers will not easily understand how the subjects of American beneficence may view the prospect of being dragged into the modern world. What does religion have to do with putting a roof over your head, earning three square meals a day and securing the possibility of a decent life for your kids? To which a Muslim might reply: in my tradition, religion has everything to do with everything. If indeed the peoples of the Islamic world are ever to enjoy access to the personal autonomy and material abundance that the West defines as freedom, Rushdie is probably right. If so, then the operative question reduces to this: Is grasping the nettle something that Muslims must decide of their own volition? Or is it a choice that hard-charging, well-meaning infidels—United States Marines, for instance—can force Muslims to make? We know what the Marines think. Developments in Marja and elsewhere in Afghanistan will show whether this time around they will get it right—or whether the United States will manage only to dig itself into an even deeper hole. Listen to an interview with Andrew Bacevich. While it shouldn't really be necessary to correct blatant hyperbole and misstatements in essays such as this, the opening sentences of this one call out for rebuttal as they set up an essentially false premise. To Mr. Bachevich's initial statement that during the Bush administration "no one paid much attention" to "the federal budget hemorrhag(ing) red ink," we might recall the presidential candidate of the Republican party, John McCain, stating that his party's own president "was spending money like a drunken sailor." If such castigation by the Republican candidate for his own president is not clear or emphatic enough to Mr. Bachevich, I doubt that a description adequate to him would be printable in this journal. Secondly, the descriptive word "hemorrhaged" needs to be placed in a proper bloody context. Compared to the immense deficits President Obama is running, which include in his response to a serious recession vast new entitlement spending proposals, President Bush's deficit spending was a mere pinprick. Or to follow McCain's colorful sailor metaphor, the drunken sailor has passed out on deck, is being fleeced by the passengers, and is about to be rolled overboard. That is why we are seeing the extreme reaction to these previously almost unimagineable deficit numbers: Bush's numbers were disappointing, but Obama's current and projected deficits are so bad as to be frightening to responsible citizens. What an interesting, informative article about Afghanistan! Bacevich is well-informed, persuasive, and even entertaining. It's a point of view that I hadn't heard before. That's what I like about America magazine. But I almost didn't even read past the gratuitous tirade against the Tea Party movement (paragraph one) that was followed by (paragraph two) a sophomoric attempt to "segue" into the "real article." I'm no Tea Partier myself, and I've occasionally found some of their rhetoric annoying too. But you just have to stay on topic if you hope to persuade people. The previous commenter is a case in point. Mr. Mattingly doesn't even seem to have read the "real article." I can't say I blame him. It's a shame that someone as perceptive and, frankly, brilliant, as Andrew Bacevich, has to caught up in the current efforts to navigate between the Scylla and Charybdis of American politics. Deficits, as any reader of Bacevich knows, are no passing, "sophomoric" fancy of his, but intimately connected to the militarization of American foreign policy. He is on topic. His topic. Read his Limits of American Power and you'll get his drift-from about page one. Other than that, what I find odd about Bacevich's argument is that he doesn't seem to think there are any secularized Muslims-anywhere, even as he quotes Rushdie with approval. They're not like us-oh, boy, and now we're in for the fire-and-brimstone Bacevich- telling us that we only go to Church on Sundays, if then, but those guys, Muslims, they're in it for the long haul.They're serious. I have a Muslim colleague. He drinks and smokes. I ask him what kind of Muslim he is. He laughs and says "a normal one." Somehow I think Bacevich has managed to convinced himself that his Muslims are the moral equivalent of pre-Vatican Catholics, who, if I take his point, prayed all day. Sure we did. We ought to leave these people alone because they don't want to be modern. They just want to face East a couple times and day and get down with Allah. Come on. I think our foreign policy is misguided. Our fiscal irresponsibility since the advent of the Great Communicator has been breathtaking. But I doubt Muslims have no interest in coming into, well, the nineteenth century, albeit on their own terms. It's one thing to say we ought to stay the Hell out of their affairs. But Iraq, for instance, was largely secularized before shock and awe. As in Iran, Western interference gave the sectarians life, and an Infidel with which to do battle. America, the magazine, distrubs me. It has a distinct propensity for running pieces on other countries whose happy peasants supposedly want to live in squalor-until they get a chance to emigrate to New York. You do them, whether in Mexico or Afghanistan, a grave and patronizing disservice. As for Bacevich, I admire him. He has paid an unimaginable price for his convictions. But we're not in Kansas anymore. He has a neat republican (small "r") vision of why America is getting all this wrong. It's an impractical back-to-the future vision, and worse, an unrealistic one. It's getting in the way of his larger point: we are on the wrong path and it will destroy us if, as he so eloquently wrote elsewhere, we don't get our house in order. I guess Bacevich isn't the only one who has trouble staying on topic. No, sigh. Some of us insist on thinking. But I'll try harder in the future. This article also appeared in print, under the headline "Deja Vu in Marja," in the March 29, 2010 issue.